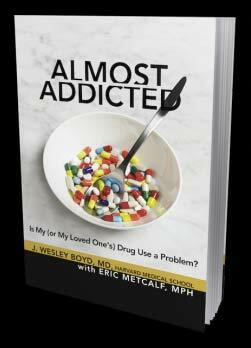 New book entitled Almost Addicted. Do you think your pot smoking is hindering your relationships? Does it feel as if you’re just a tad too dependent on the pills your doctor prescribed for pain? Almost Addicted will help you assess your or your loved one’s drug use and evaluate its impact on relationships, work, and personal well-being. Most people who abuse illegal drugs don’t fit the image of the dysfunctional, hustling addict who can’t fit into normal society. Between the estimated 10 percent of the population who are true addicts and those who don’t use drugs at all falls a group of regular drug users who oftentimes don’t realize how much their use is affecting their daily lives. According to J. Wesley Boyd, MD, of Harvard Medical School, and Eric Metcalf, MPH, these people are are almost addicted. Whether their drug of choice is legal or illegal, an upper or a hallucinogen, an almost addicts’ drug use is negatively impacting their quality of life—but falls short of meeting the diagnostic criteria for substance abuse or dependence. make informed decisions about next steps, including getting professional help if needed. This entry was posted in Addiction and tagged addiction, almost addicted, psychiatry, substance abuse. Bookmark the permalink.